The exterior of Harrods in London. A department store is a retail establishment which specializes in selling a wide range of products without a predominant merchandise line. 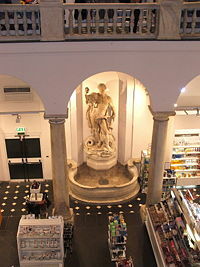 The purpose of the department store is to cater to the needs and roles of all social classes. Department stores generally sell a wide variety of products, including apparel, furniture, appliances, electronics, and additional select lines of products such as paint, hardware, toiletries, cosmetics, photographic equipment, jewelry, toys, and sporting goods. Certain department stores are further classified as discount stores, which commonly have central customer checkout areas, generally in the front area of the store, and usually do not carry brand names. Department stores affect their surrounding culture, both positively and negatively as do shopping malls and chain stores. However, the stores themselves have also been affected by changes in society. As both the external technology and the social aspects of the retail business continue to make advances, the role of department stores, if any, in future society will be determined by how they adjust to these changes. 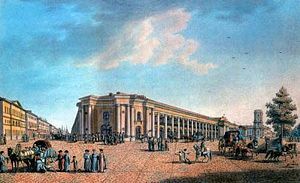 The great Gostiny Dvor in St Petersburg, 1802. The Hudson's Bay Company in Canada was the first store to include departments; however, by modern standards, it would not be considered a department store because of the size and range of items that were stocked. The same may be said about Gostiny Dvor in St Petersburg, which opened in 1785 and should probably be regarded as one of the first purposely-built shopping malls in the world, as it consisted of more than 100 shops covering an area of over 53,000 square meters. 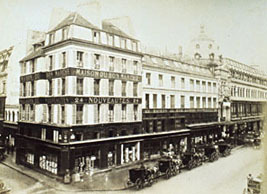 The first true department store was founded by Aristide Boucicaut in Paris. He founded Bon Marché in 1838, and by 1852 it offered a wide variety of goods in "departments" inside one building. Goods were sold at fixed prices, with guarantees allowing exchanges and refunds. By the end of the nineteenth century, Georges Dufayel, a French credit merchant, had served up to three million customers and was affiliated with La Samaritaine, a large French department store established in 1870 by a former Bon Marché executive. As Bon Marché evolved into a fully fledged department store in the early 1850s, Delany's New Mart opened in 1853 in Dublin, Ireland on Sackville Street (now O'Connell Street). What made Delany's different from most department stores of its time was its purpose-built nature; unlike others it had not evolved gradually from a smaller shop on site. Constructed to a lavish standard on the city's principal street, it was designed to rival the biggest and best in Europe. Acquired by the Clery family in the late nineteenth century, both the store and Imperial Hotel, located in its upper floors, were completely destroyed in the 1916 Easter Rising. However the store reopened in 1922, this time across numerous floors, as the famous Clerys department store that stands today, housed in a striking modern neoclassical building based on Selfridges of London. In New York City in 1846 Alexander Turney Stewart established the "Marble Palace" on east-Broadway, between Chambers and Reade Street. He offered European retail merchandise at fixed prices on a variety of dry goods, and advertised a policy of providing "free entrance" to all potential customers. Though it was clad in white marble to look like a Renaissance palazzo, the building's cast iron construction permitted large plate glass windows. In 1862 Stewart built a department store on a full city block at Broadway and 9th Street, opposite Grace Church, with eight floors and nineteen departments of dress goods, furnishing materials, carpets, glass and china, toys and sports equipment, ranged around a central glass-covered court. Within a couple of decades, New York's retail center had moved uptown, forming a stretch of retail shopping from "Marble Palace" that was called the "Ladies' Mile." In 1858, Rowland Hussey Macy founded Macy's as a dry goods store. Benjamin Altman and Lord & Taylor soon competed with Stewart as New York's first department stores, later followed by "McCreary's" and, in Brooklyn, "Abraham & Straus" (The Straus family would be in the management of both Macy's and A&S). Similar developments were under way in London (with Whiteleys), in Paris (with La Samaritaine) and in Chicago, where department stores sprang up along State Street, notably Marshall Field and Company, which remains the second-largest store in the world (after Macy's). In 1877, Wanamaker's opened in Philadelphia. Philadelphia's John Wanamaker performed a nineteenth century redevelopment to the former Pennsylvania Railroad terminal in that city and eventually opened a modern day department store in the building. On March 1, 1869 Zion's Cooperative Mercantile Institution was opened in Salt Lake City as a new community store that became the first incorporated department store in America in 1870. A new 3-story brick and iron store was built in 1876, noted for its unique architecture and striped awnings. This store was replaced by an enclosed shopping center in 1973, but the new Zion department store preserved the gilt-edged ornate facade of the old store. In 1999 the May Department Stores bought a 14-store ZCMI chain and changed its name to "Meier & Frank," a May property with eight stores in Oregon and Washington. Subsequently, May Department Stores completed a merger with Federated Department Stores and the Meier & Frank brand ZCMI stores became Macy's stores. In 1881, Joseph Lowthian Hudson opened a small men's clothing store in Detroit. After ten years he had eight stores in the midwest and was the most profitable clothing retailer in the country. In 1893 he began construction of the immense department store at Gratiot and Farmer Street in Detroit. The 25-story tower was added in 1928, and a 12-story addition in 1946, giving the entire complex 49 acres of floor space. In 1954, the company became a suburban shopping center pioneer when it built Northland 13 miles northwest of Detroit. In 1969, it merged with the Dayton Corporation to create Dayton-Hudson headquartered in Minneapolis. George Dayton had founded his Dayton's Daylight store in Minneapolis in 1902 and the AMC cooperative in 1912, built the Southdale Shopping Center in 1956, and started the Target discount store chain in 1962. The new corporation closed the flagship Hudson department store in downtown Detroit in 1983, but expanded its other retail operations. It acquired Mervyn's in 1978, Marshall Field's in 1990, and renamed itself the Target Corporation in 2000. By 1890, a new world of retailing had been created as department stores had a clear market position as universal providers. General stores eventually became department stores as small towns became cities. The most prominent department stores emerged from small shops. The department store created several of North America's first large businesses. The department store is also largely responsible for the standard store design seen today. Because of its size it required new building materials, glass technology, and new heating, amongst other architectural innovations. The store layouts made shopping easier for consumers regardless of their social or economic background. The department store also offered new customer services never before seen such as restaurants, restrooms, reading rooms, home delivery, wrapping services, store hours, new types of merchandise displays and so forth. 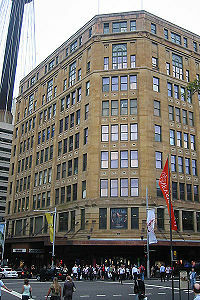 David Jones department store building on the corner of Elizabeth Street and Market Street in Sydney. Some department stores leased space to individual merchants, similar to the changes in late seventeenth century London, but by 1900 the smaller merchants were purchased or eventually replaced by the larger companies. In this way they were very similar to our modern malls, where the property owner has no direct interest in the actual department store itself, other than to collect rent and provide utilities. Today only the most specialized departments are leased out, such as photography, photo finishing, automotive services, or financial services. However, today this is rare, as most departments—even a store's restaurant—is usually run by the store itself. Before the 1950s, the department store held an eminent place in both Canada and Australia, during both the Great Depression and World War II. Since then, they have suffered from strong competition from specialist stores. 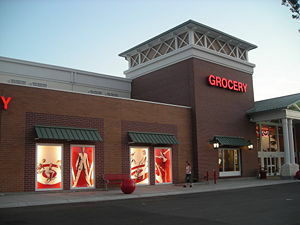 Most recently the competition has intensified with the advent of larger-scale superstores (Jones et al. 1994; Merrilees and Miller 1997). Competition was not the only reason for the department stores' weakening strength; the changing structure of cities also affected them. The compact and centralized nineteenth century city with its mass transit lines converging on the downtown was a perfect environment for department store growth. But as residents moved out of the downtown areas to the suburbs, the large, downtown department stores became inconvenient and lost business to the newer suburban shopping malls. Sells brand name perfumes and beauty supplies, like Burberry and Calvin Klein at the main entrance, and have specialists in cosmetics there to assist customers with applying and selecting makeup. Generally sells name brand clothes above an average price level, such as Dior, Chanel, Versace, LaCoste, and so forth. When items are on sale, the price resembles that of an average priced item at a lower scale department store. May sell small household appliances. Discount department stores sells products at prices lower than those asked by traditional retail outlets. Most discount department stores offer wide assortments of goods; others specialize in such merchandise as jewelry, electronic equipment, or electrical appliances. Discount stores are not dollar stores, which sell goods at a dollar or less. Discount stores differ because they sell branded goods and prices vary widely between different products. Discount department stores are more popular in the United States than other countries. Following World War II, a number of retail establishments in the United States began to pursue a high-volume, low-profit strategy designed to attract price-conscious consumers. During the period from the 1950s to the late-1980s, discount stores were more popular than the average supermarket or department store. There were hundreds of discount stores in operation, with their most successful period occurring during the mid-1960s in the United States with discount store chains such as Kmart, Zayre, Kuhn's-Big K (sold to Wal-Mart in 1981), GEM, TG&Y, and Woolco (closed in 1983, part sold to Wal-Mart) amongst others. 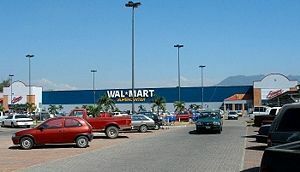 Currently, Wal-Mart, the largest retailer in the world, operates 1,353 discount stores in the United States; Target and Kmart are Wal-Mart's top competitors. Examples of discount retail chain stores include Wal-Mart, Kmart and Target, all of which opened their first locations in 1962. Other retail companies branched out into the discount store business around this time as adjuncts to their older store concepts. As examples, Woolworth opened a Woolco chain; Montgomery Ward opened Jefferson Ward; Chicago-based Jewel launched Turn Style; and Central Indiana-based L.S. Ayres created Ayr-Way. These chains typically were either shut down or sold to a larger competitor during the late 1970s and early 1980s. Kmart and Target themselves are examples of adjuncts, although their growth prompted their respective parent companies to abandon their older concepts (the S.S. Kresge five and dime store disappeared, while the Dayton-Hudson Corporation eventually divested itself of its department store holdings and renamed itself Target Corporation). Many of the major discounters are now opening "supercenters," which add a full-service grocery store to the traditional format. The Meijer chain in the Midwest consists entirely of supercenters, while Wal-Mart and Target have focused on the format as of the 1990s as a key to their continued growth. Although discount stores and department stores have different retailing goals and different markets, a recent development in retailing is the "discount department store," such as Sears Essentials, which is a combination of the Kmart and Sears formats, following the companies' merger as Sears Holdings Corporation. Every country has different department stores and different histories behind the development of department stores in their nation. They all serve the same function, selling multiple products to the public. Here is a list of different examples of department stores in different parts of the world. Department stores first appeared in China at the beginning of the twentieth century, the concept said to be introduced by expatriate Chinese living in Australia. Before 1949, there were four main department stores in Shanghai: Wing On, Sincere, Sun Sun, and Yat Sun; the first two still exist today. During World War II patriotic sentiment in China had led to the formation of a number of department stores specializing in locally-made merchandise. This type of store became the mainstay in China after the formation of the Communist state in 1949. Both types of department stores have long had branches in Hong Kong. The Asian financial crisis of the late 1990s resulted in the closure of some of these stores, but on the whole, Hong Kong still has one of the world's most competitive retail markets. Japanese department stores began to appear in the 1960s, and within a generation's time became the dominant force in the market. Some of the largest department stores include Hankyu, Hanshin, Isetan, Marui, Mitsukoshi, Purantan (Printemps), Seibu, Tobu, and Tokyu. Many are owned and operated in conjunction with private railway companies. The most famous department store chains in Finland are Stockmann, a listed company, and Sokos, owned by a nationwide retailing cooperative. The Stockmann department store in central Helsinki is the largest department store in the entire Nordic countries and a famous landmark of Helsinki. France's major department stores are Galeries Lafayette and le Printemps, which both have flagship stores on Boulevard Haussmann in Paris and branches around the country. Part of the same group as Galeries Lafayette, the BHV (Bazar de l'Hotel de Ville) has a more mid-market clientele. The oldest department store in France (and maybe in the world) is still Le Bon Marché in Paris. La Samaritaine was bought by LVMH and closed in 2005. In Germany there are a number of well-known department stores. There are two dominant department store companies, KarstadtQuelle (Karstadt and Hertie) and Kaufhof (part of the Metro AG). There are also some smaller independent department stores. Some department stores only sell clothing. The biggest clothing department store chain is C&A. Larger department stores in Germany usually contain a self-service restaurant, clothing departments, a toy department, a department for computer and electronics, a small book department (for bestsellers), a department for newspapers and magazines and a food department (like a supermarket). One of the most famous department stores in Germany is the Kaufhaus des Westens (German for department store of the west) which is located in Berlin. Originally the Republic of Ireland had two department stores, Clerys and Arnotts, the latter considered to be one of the five largest stores in Britain and Ireland. However several large retailers now own chains of department stores, such as Dunnes Stores, Roches Stores, and Marks & Spencer. The most upmarket chain is undoubtedly Brown Thomas, founded as a haberdasher's in 1849 on Dublin's Grafton Street. The company (which belongs to the same group as the UK's Selfridges or Canada's Holt Renfrew) bought its long time competitor across the street, Switzers, in 1995. BT then moved to the larger site. It also acquired and re-branded the former Switzer stores in Cork (formerly Cash's), Limerick (formerly Todd's) and Galway (formerly Moon's). There are also many self-owned department stores around the country, especially in rural towns. The British department store, Debenhams, has a Dublin city center site within the Jervis Centre. The opening of the Dundrum Shopping Centre in Dublin's suburbs saw the arrival of two more British stores, House of Fraser and Harvey Nichols. The GUM facade faces Red Square. 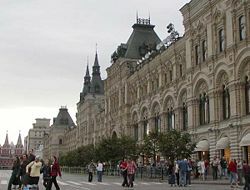 Russia has many famous Departement stores, including the GUM in Moscow and the Petrovsky Passage. In Saint Petersburg there is The Passage, which is extremely popular. In the UK the term "department store" still refers to the traditional, classic department store, which has a wide range of independent departments with their own staff and their own tills. All of the early department stores in London started out as small drapery stores which bought up neighboring stores and increased their range of products. Whiteleys in Westbourne Grove was first to grow to department store size. By 1867 it consisted of 17 departments and by 1890 it was operating in a purposely built department store and had over 6,000 staff employed in the business. Barkers in Kensington can be defined as a department store by 1880, when it encompassed 15 neighboring stores, and in 1889, the company moved into a new, large building. This was eventually taken over by House of Fraser and closed for business in 2006. Peter Jones in Sloane Square had grown to department store size by 1890. 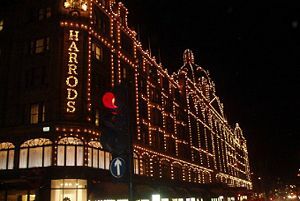 Harrods was reborn as a proper department store in 1889, after a devastating fire in 1883. John Lewis in Oxford Street was a true department store by 1900. Selfridges was opened in 1909 by the American entrepreneur Harry Gordon Selfridge, and thus became London's seventh department store. In Edinburgh, Jenners saw a similar development. It starting as a drapery store in 1838, which by 1890 had grown into Scotland's largest retail store by taking over all the small stores in the neighborhood. In 1895, after a devastating fire, a new ultra-modern building opened, with lavish electrical lighting, hydraulic lifts and air conditioning. Four hours after the grand opening, 25,000 people had already visited the store. The exterior of a typical Macy's department store (formerly Burdines) at Town Center at Boca Raton located in Boca Raton, Florida. In the United States, companies such as Macy's, Dillard's, Sears, and J.C. Penney are considered department stores, while retail brands such as Target, Kmart, and Wal-Mart are discount department stores. T.J. Maxx, Marshalls, and Burlington Coat Factory are stores that sell designer goods at discount prices. Stores that carry a general line of groceries and other product lines similar to those of department stores are considered warehouse clubs or supercenters. Warehouse clubs require a nominal annual membership fee, while supercenters do not. Costco, BJ's Wholesale Club, and Sam's Club are examples of warehouse clubs. Department stores stock what consumers need. The supplies found in a department store are touted as products people need in order to define their roles and status in society. Department stores create a supply, and through advertisements, people come to understand that they need what the department store is selling. These stores are social institutions that shape mainstream popular culture. There has been a decrease in the number of shoppers at department stores in favor of low price stores, forcing department stores to attempt new attractions to draw consumers in to their store. One of the biggest criticisms to department stores is their treatment of their own workers. Many department stores, including Target and Wal-Mart, take a very negative stance on labor unions. Some do not require a certificate of living wage, bringing into question the wages that some laborers are making. Child labor has also become a sore point for many department stores. In Wal-Mart, it was reported that minors missed breaks, worked over time and into the night, and over their specified legal hours. Issues of religious, racial, and cultural intolerance have also marred the images of department stores. Department stores have also been noted to contribute to urban sprawl. They find open areas of untouched land and set up their stores there, damaging the ecosystem and the environment through the stores practices and the draw of automobiles and trash to the area. Department stores have also opened stores in locations near religious or historical landmarks, causing a backlash from some consumers who say that department stores only care about maximizing their profits by drawing in as many people as possible. Different department stores reflect different kinds of spending. Upscale and discount stores carry different products that cater to the consumer. An upscale store may carry better quality and more expensive products, while a discount store carries items for less. Department stores branch in urban and suburban areas. In many rural locations, they are the only store in the vicinity to provide products for that populace. Department stores have been sometimes accused of predatory pricing. This process involves selling goods at a much cheaper value than other independent stores in the area in order to shut them down. This is seen as a monopolization of the department store sector, limiting choice of stores to only a few major chains rather than a host of smaller, independently owned stores. When the smaller stores are driven out of business, the major department store is the only one of its kind in the area. If profits are not up to standard, that store will shut down, leaving an area with no department store which originally had many. The function of department stores is to supply the public with goods. Because of the different tiers of department stores, the general population is able to obtain the goods and products they need. There is a divide between the types of department stores where upper, middle, and lower class people shop, however, the department stores are able to provide those of any social class a product at a price affordable to their wealth and income. This is the success of department stores. Their services are an essential part to many countries' daily living, and so they grow and thrive, transforming culture as they evolve. ↑ Helen Laurenson, Going Up Going Down: The Rise and Fall of the Department Store (Auckland University Press, 2005, ISBN 978-1869403416). ↑ Jan Whitaker, Service and Style: How the American Department Store Fashioned the Middle Class (St. Martin's Press, 2006, ISBN 978-0312326357). ↑ Joe Gose, Malls Continue to Fend Off Their Critics, National Real Estate Investor (Prism Business Media, 2003). Retrieved June 14, 2007. ↑ Steven Greenhouse, In House Audit Says Wal-Mart Violated Labor Laws, New York Times (2004). Retrieved June 14, 2007. ↑ James McKinley Jr., No, the Conquistadors Are Not Back. It's Just Wal-Mart, New York Times (2004). Retrieved June 14, 2007. ↑ Staff Writer, Wal-Mart Charged with Predatory Pricing, The Hometown Advatange (2000). Retrieved June 14, 2007. Abelson, Elaine S. 1989. When Ladies Go A-Thieving: Middle Class Shoplifters in the Victorian Department Store. New York: Oxford University Press. Barth, Gunther. 1980. "The Department Store." In City People: The Rise of Modern City Culture in Nineteenth-Century America. New York: Oxford University Press. Benson, Susan Porter. 1988. Counter Culture: Saleswomen, Managers and Customers in American Department Stores, 1890-1940. Urbana, IL: University of Illinois Press. ISBN 0-252-06013-X. Ershkowicz, Herbert. 1999. John Wanamaker, Philadelphia Merchant. New York: DaCapo Press. Gibbons, Herbert Adams. 1926. John Wanamaker. New York: Harper & Row. Hendrickson, Robert. 1979. The Grand Emporiums: The Illustrated History of America's Great Department Stores. New York: Stein and Day. Leach, William. 1993. Land of Desire: Merchants, Power, and the Rise of a New American Culture. New York: Pantheon. ISBN 0-679-75411-3. Parker, K. 2003. "Sign Consumption in the 19th-Century Department Store: An Examination of Visual Merchandising in the Grand Emporiums (1846-1900)." Journal of Sociology 39 (4): 353–371. Schlereth, Thomas J. 1991. Victorian America: Transformations in Everyday Life, 1876-1915. New York: HarperCollins. Sobel, Robert. "John Wanamaker: The Triumph of Content Over Form." In 1974. The Entrepreneurs: Explorations Within the American Business Tradition New York: Weybright & Talley. ISBN 0-679-40064-8. Spang, Rebecca L. 2000. The Invention of the Restaurant: Paris and Modern Gastronomic Culture. Cambridge, Mass. : Harvard University Press. Whitaker, Jan. 2006. Service and Style: How the American Department Store Fashioned the Middle Class. New York: St. Martin's Press. ISBN 0-312-32635-1. This page was last modified on 26 October 2017, at 15:27.